Panmunjeom (판문점), also P'anmunjŏm, is on the demarcation line between North and South Korea. A unique living relic of the Cold War era, Panmunjeom is a small village that happened to lie at the final battle front of the Korean War. The truce that ended hostilities was signed here in 1953, but as peace was never agreed to, the two sides are still officially at war over sixty years later and a million men stand guard around the Demilitarized Zone (DMZ). There are no troops in the DMZ itself (except in the JSA), although both sides of the 4-kilometer strip of land separating the Koreas are the most heavily armed in the world: Pillboxes, land mines, barbed wire, and tank stoppers line the entire border and stretch back halfway to Seoul in the South and Pyongyang in the North. This section is often referred to as the Militarized Zone. In South Korea there are also adjacent border areas called Civilian Control Zones where public access is restricted. One kilometer east of the former village (now deserted) is the Joint Security Area (JSA), an almost circular patch of land with an 800-meter diameter. The area is jointly policed by the South and North, and the two sides occasionally meet for discussions (or gunshots). Most of the time the soldiers glare at each other across the border and have not been allowed to cross the demarcation line into each other's side since the Axe Murder Incident in 1976 (see below). Panmunjeom is on the Military Demarcation Line, which is the actual border between North and South Korea. The DMZ is a buffer along the north and south sides of the MDL (2 km into North Korea and 2 km into South Korea). Access to the DMZ is occasionally curtailed at short notice when tensions rise, most recently in May 2010 in the aftermath of the Cheonan sinking. As of July 2010, tours are operating normally again. Visits to Panmunjeom from the South Korean side must be arranged in advance as part of an organized tour, although for foreigners three days' notice usually suffices (longer over weekends). Many companies advertise "daily" tours, but generally tours to the DMZ run only certain days, so check in advance. On tour days, depending on the day, various combinations of tours to 3rd tunnel, tours to Panmunjeom, and joint tours are available. The rules for who can enter are set by the UN and the US, not North Korea. At present, citizens of China and South Korea will need to make arrangements well in advance (at least two months), while citizens of Afghanistan, Pakistan, Cuba, Iraq, Iran, the DPRK, Sudan, Syria and Libya cannot participate. Note that Hong Kong/Macau SAR passports are considered "Chinese", so use a British National (Overseas) or Portuguese passport instead if you can. USO, tel. +82-2-795-3028, . The US military servicemen's organization offers tours that cover both the JSA and the Third Tunnel. Averaging twice a week, payment must be made no less than four days in advance and places fill up fast. US$77 for civilians, lunch not included (bring your own or W10,000 for chow at the canteen). The tours depart from USO's downtown Seoul complex near subway Samgakji stn at 7am and last until approx. 3.30pm. Tours never run on U.S. holidays and are announced on the month they occur. Panmunjom Tour, tel. +82-2-7715593, . A specialist company offering various tours of the JSA (from W77,000) and the DMZ (W60,000; W120,000 with JSA tour). Tours start early in the morning, include lunch and get you back in Seoul by the afternoon. Some Seoul-based companies such as Cosmojin Travel and Grace Travel require only a minimum of 24 hours' notice, but their prices are much higher. Also, their itineraries vary, and may not include entry into the DMZ. The 62-km journey towards Panmunjeom is a sight in itself. The 12-lane Freedom Road becomes eerily empty as you approach the border, as its primary purpose is to get tanks there as fast as possible if war breaks out. To repel an invasion, both sides of the highway, especially the side facing the Imjin River and open water to North Korea, are covered with barbed wire and dotted with observation posts every few hundred meters. Nearby hills house machine gun emplacements, the median strip has clusters of sandbags for defense, and some bridges above the highway have huge concrete blocks that can be dynamited to block the road. Large illuminated signs, proclaiming Freedom and Democracy in hangeul, face the North. To visit from the DPRK side is relatively straightforward if it is previously specified as part of your tour (most tours include a day trip to the DMZ from Pyongyang). See North Korea for tour agent listings. The JSA is 215 kilometers south of Pyongyang. The two are connected by the six-lane Reunification Highway, which much like its Southern counterpart is vast, but ultimately poorly maintained and simply empty. Signs along the road count down not the distance to the DMZ, but to Seoul. From the South, travel within the DMZ is possible only in UN vehicles, and you'll be transferred to a UN bus at Camp Bonifas, accompanied by a soldier who will serve as a tour guide in the JSA. 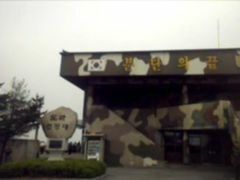 From the North, you will reboard your tour bus at the entrance to the DMZ, accompanied by a member of the Korean People's Army (KPA). When booking your tour, be sure to clarify what exactly will be offered. The primary points of interest for most visitors from the south are the Joint Security Area and the Third Tunnel, but not all tour companies have clearance to visit these and you'll have to pay a small premium for those that do. From the North you will be able to visit the original site of the Panmunjeom village and the Peace Museum that was originally built for and houses original copies of the 1953 armistice. From there it is a short drive to the JSA. Camp Bonifas, at the southern entrance to DMZ. This is the US/South Korean military base standing "In Front of Them All" should an attack come. Visitors to Panmunjeom will change buses and get briefed here before entering the DMZ. Freedom House, JSA. South Korea's propaganda palace facing the demarcation line. Visitors are usually taken to the Peace Pagoda next to it, which provides good views of the JSA and surrounding countryside. Accessible only from the Southern side. Panmun-guk, JSA. North Korea's propaganda palace facing the demarcation line. Accessible only from the Northern side. T1 through T3, JSA. These are the conference rooms straddling the border: the neat lines of microphones and, outside, the low concrete bar mark the exact position of the line of demarcation. Both South and North Korean soldiers in intentionally intimidating poses stand guard in and around the rooms. You're free to walk around the conference room and can hop from South to North if you wish. Just don't try to leave by the other exit! Bridge of No Return, JSA. After the Korean war, some prisoners of war were given the choice to cross over the bridge or to stay on the side of their captors, hence the name. On August 18, 1976, a US attempt to cut down a poplar tree obstructing visibility of the bridge led to a battle with North Korean forces that left Capt. Arthur Bonifas and Lt. Mark Barrett dead in what was later known as the Axe Murder Incident. The bridge is now closed and a new bridge to the north is used instead. Usually visited from the South only. North Korea Peace Museum, 500m north of the JSA. The building where the armistice agreement was signed. The actual documents are kept here, guarded over by a tattered, faded UN flag and a miraculously well-preserved DPRK flag. The axe of Axe Murder Incident fame is also stored here. Accessible from the North only. Taesong-dong, DMZ. South Korea's showpiece "Freedom Village" in the DMZ, containing a little over 200 farmers working under 24-hour military guard and a 100-meter flagpole. The only ways to become a member of the village is to be born into it or by marriage (women only). Entry into the village is not permitted, but you will pass by on your way to the JSA from the South side. Kijong-dong, DMZ. On the North Korean side, this is a former village built up with fancy apartment blocks and a 160-meter flagpole entered in the Guinness Book of World Records as the world's tallest — but nobody lives there, hence its common name "Propaganda Village". Entry into the village is not permitted, but it is clearly visible from the JSA (although binoculars will come in handy). On the South Korean side, sites outside the DMZ can be visited more cheaply and with less hassle. An hourly train runs between Seoul and Imjingak for about ￦ 1300 each way. Bus tours passing the Second & Third Tunnel cost ￦ 8000. This is an excellent alternative for the DMZ tours, though it is not possible to visit Panmunjeom this way. Imjingak, Paju. A four-story museum and observatory 7 km south of the DMZ, with views across the Kaesong River towards the DMZ and North Korea. The train line to Pyongyang passes nearby. This is the closest you can get to the DMZ without security clearance. The museum is open 9 AM to 6 PM daily. Second & Third Tunnel. Two of four tunnels secretly dug by the North Koreans that have been discovered so far. All tourist facilities for foreigners in the DPRK include a gift shop, and the gateway to the DMZ is no exception. Just inside the concrete wall you can purchase Korean art and amongst other things, of course, endless amounts of literature on the Great Leader Kim Il Sung and his son Kim Jong Il. Prices are reasonable. "The Monastery" in Camp Bonifas — actually a former officers' club, whose members used to wear brown robes for ceremonies and call themselves the "Merry Mad Monks of the DMZ" — has a gift shop retailing DMZ-related paraphernalia, including chunks of rusty barbed wire from the original demarcation line (W25,000) as well as blueberry wine from North Korea (brought in via a long detour through China). The canteen in Camp Bonifas is no longer open to the civilian visitors, so most tours now head to eat elsewhere. There is no food available for purchase on the Northern side and the closest available facilities are in Kaesong. When entering from South Korea, consumption of alcohol in the DMZ is prohibited and only allowed on special occasions. A tour from the Northern side is considerably more laid back and you may bring your own beverages (if purchased back at the rest stop halfway between Pyongyang and the DMZ). There is no accommodation for the general public at Panmunjeom. Most visitors from the south day-trip from Seoul, while visitors from the north either do a long day-trip from Pyongyang or overnight in Kaesong. Room and board at Camp Bonifas is restricted to active duty soldiers in the United States Armed Forces. However, retired servicemen who have received the Medal Of Honor might be able to stay on a "space available" basis. Contact the United Nations Command Security Battalion - Joint Security Area  for enquiries. From the South, a strict dress code  applies for all visitors: "faddish, extreme, torn, tattered, frayed, overly provocative or otherwise inappropriate" clothing is not allowed. Sports clothes (incl. tracksuits), military clothing, oversized clothing, sheer clothing, sleeveless shirts/tops, tank tops, anything that bares the midriff or the buttocks, and flip flop-type sandals are specifically banned; clean jeans with a clean T-shirt, on the other hand, are fine. The proclaimed purpose is twofold: one to make sure scruffy hippies don't end up on North Korea's propaganda posters, and the other to make sure nobody trips and falls if somebody starts shooting. Within the DMZ, photography outside designated points is not permitted, even from the tour bus. Cameras are subject to inspection by the South Korean MPs. Lenses of up to 90mm focal length are allowed although in practice lenses slightly longer than this have been allowed. Tripods are prohibited. You must stay together with the group and follow the tour leader's instructions at all times. In the JSA pointing, waving and gesturing are all off-limits. Your group will be asked to walk around in two lines when in sight of the North Korean side. From the North, visits to the DMZ are more casual than from the South (e.g., beer is allowed) and restrictions are minimal, although it is wise to show a level of respect and etiquette that befits the highly sensitive location. Unrestricted photography is permitted at the JSA and the Peace Museum. Elsewhere you will have to ask permission. From the South, entry into the JSA/DMZ requires signing a voucher where you agree to accept responsibility for "injury or death as a direct result of enemy action". Remember: it may be in a state of suspended animation, but both sides have itchy trigger fingers and it's still a war zone. Tour companies can and do suspend tours at short notice if the situation escalates, and it's unlikely you'll be allowed into the DMZ if there's any real risk. WARNING: Unless you're planning to risk your life in an attempt to defect, this would be the worst place in the world to attempt to cross a border. You should realize that you will be risking other soldiers lives, as these had happened in past incidents. Therefore, DO NOT attempt to sneak across the border! People who had been trying to sneak across the border HAVE BEEN ARRESTED, and as a consequence have been deported (at best). On top of that, there are risks of getting killed by landmines, tanks and soldiers from either side, and the border is heavily lined with barbed wire. This page was last edited on 24 December 2017, at 18:31.